The Doherty Center for Creativity, Innovation and Entrepreneurship invites participation by students in all Elon University academic programs. Elon University’s Doherty Center for Entrepreneurial Leadership is being renamed the Doherty Center for Creativity, Innovation and Entrepreneurship. The new name was announced by President Leo M. Lambert at the Evening for Elon event in New York City on Sept. 13. 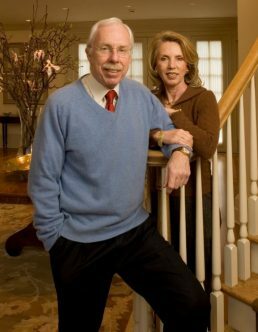 The annual event is sponsored by trustee Ed Doherty and his wife Joan Doherty, of Saddle River, New Jersey, who endowed the Doherty Center with a $1 million gift in 2007. The Dohertys, parents of 2007 Elon alumna Kerry Doherty Gatlin, are successful entrepreneurs. Their company, Doherty Enterprises, Inc., is one of the nation’s leading franchisee operators of quality family restaurants, including Applebee’s Neighborhood Grill & Bar, Panera Bread and Chevys Fresh Mex. Through the Doherty Center, students learn to look at problems and challenges from an innovative perspective. “They are encouraged to develop critical thinking skills, recognize opportunities and think creatively to find solutions,” said Alyssa Martina, director of the center and lecturer in the Love School of Business. As with other Elon academic programs, the Doherty Center focuses on hands-on experiences and engaged learning opportunities. The center also encourages students to consider the social impact of their entrepreneurship and the ways they can make a positive impact in the world. The Doherty Center for Creativity, Innovation and Entrepreneurship is currently headquartered in the Ernest A. Koury Sr. Business Center. In fall 2018 it will move into specially designed space in the new Richard W. Sankey Hall, which is under construction adjacent to the Koury Business Center. The new facilities will provide more space with a flexible design to facilitate group projects, creative activities and one-on-one mentoring between faculty and students. Copyright © 2017. Doherty Inc.